Julia Angwin is an award-winning senior investigative reporter at ProPublica, a nonprofit newsroom in New York. From 2000 to 2013, she was a reporter at The Wall Street Journal, where she led a privacy investigative team that was a finalist for a Pulitzer Prize in Explanatory Reporting in 2011 and won a Gerald Loeb Award in 2010. Her book Dragnet Nation: A Quest for Privacy, Security and Freedom in a World of Relentless Surveillance was published in 2014 and was shortlisted for Best Business Book of the Year by the Financial Times. Julia is an accomplished and sought-after speaker on the topics of privacy, technology, and the quantified society that we live in. Among the many venues at which she has spoken are the Aspen Ideas festival, the Chicago Humanities Festival and keynotes at the Strata big data conference and the International Association of Privacy Professionals. In 2003, she was on a team of reporters at The Wall Street Journal that was awarded the Pulitzer Prize in Explanatory Reporting for coverage of corporate corruption. She is also the author of Stealing MySpace: The Battle to Control the Most Popular Website in America. She earned a B.A. in mathematics from the University of Chicago and an MBA from the Graduate School of Business at Columbia University. You can follow Julia on Twitter. 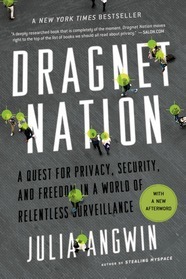 In Dragnet Nation, award-winning investigative journalist Julia Angwin reports from the front lines of America's surveillance economy, offering a revelatory and unsettling look at how the government, private companies, and even criminals use technology to indiscriminately sweep up vast amounts of our personal data. Privacy as a Luxury Good In this talk, Julia tells her personal story about trying to protect her privacy. During the process, she realized that privacy had transformed into an expensive luxury good. Her goal is to re-frame the conversation of privacy as a human right rather than a consumer product. Artificial Intelligence Economy: Its Effect on Free Speech and Thought Julia explores the role that algorithms and artificial intelligence play in our lives, as well as how difficult it is to hold machines accountable for the decisions they make.